A naming ceremony of the third patrol vessel, RNOV Sadh, was held in September 2015. Image: courtesy of Valmet. Bio-fuels will account for approximately 40% of feedstock in the initial operational phase and will increase to approximately 70% in the long run. Image: courtesy of Fortum. Siemens is supplying its SST-800 turbine for the multi-fuel power plant. Image: courtesy of www.siemens.com/press. The new power plant will integrate with existing facilities to provide district heating requirements for decades. Image: courtesy of Turku Energia. 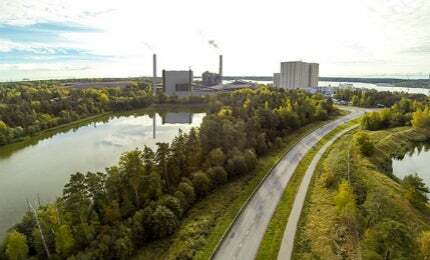 NA4 CHP is a multi-fuel combined heat and power (CHP) plant that is being constructed at the existing site of the NA1, NA2 and NA3 coal-fired power plants in Naantali, Finland. It will replace the NA1 and reduce the capacity of NA2. The project is being implemented by a consortium of Turun Seudun Energiantuotanto (TSE), A-Insinöörit, AX-LVI Consulting and YIT. TSE will own and operate the plant. It is further owned by Fortum (49.5%), Turku Energia (39.5%), city of Raisio (5%), city of Kaarina (3%) and city of Naantali (3%). The combined heat and power plant will have an installed capacity of 244MW of heat, 142MW of electricity and 50MW of steam. Its annual output will be 900GWh of electricity and 1,650GWh of heat. Project plans were initiated by TSE in April 2014. The engineering phase began in May 2014 and commissioning is scheduled in late-2017. It is expected to generate approximately 500 construction jobs at peak and 250 full-time jobs, primarily associated with fuel supply. The overall cost for the development of the new plant is expected to reach approximately €260m ($291m). A €210m ($235m) loan for the project is being provided by Pohjola Bank, Svenska Handelsbanken, and Swedbank. The lenders were advised by Borenius, whereas TSE was advised by Castrén & Snellman. The remaining amount is being contributed by project shareholders. The project will primarily involve the construction of the boiler and turbine buildings, bio-fuels receiving and storage facilities, and ancillary facilities such as access roads and parking areas. As of September 2015, construction of the boiler building is on the verge of completion, the piling and foundation work has begun for the flue gas treatment system and the ash silo area. The foundation laying for the turbine and its ancillary equipment has started and foundations for the conveyer and chimney have been completed. Hanhikivi 1 is a planned nuclear power plant in Pyhäjoki in northern Finland. The multi-fuel power plant is designed to operate using biomass, coal and recycled waste as its feedstock. Biomass, which will be used as the primary feedstock will comprise mainly woodchips, sourced either locally from a radius of approximately 100km to 150km around the plant site or shipped. The plant is expected to initially use approximately 700,000m³ of woodchips, which is expected to increase to 1.2m cubic metres. The plant’s biomass handling facility will comprise three reception lines, two screening lines, a 120m long storage building with a storage capacity of 15,000m³, and two reclaimers with a combined reclaiming capacity of 700m³ an hour. The new coal handling facilities, with a combined capacity of 1,000m³, will be integrated with existing facilities. A main component of the power plant is the boiler, which will be based on circulating fluidised bed technology, integrating multiple fuel supply lines. The fully automated facility can be remotely controlled. Circulating fluidised bed technology involves feeding fuel to a fluidising material bed comprised of sand, ash and limestone. Fluidising air is then passed, which rapidly mixes with the solid fuel / fuels, drying and burning any crushed material below the size of 50mm. The plant emits very little nitrogen oxide due to operation under low temperature (below 900°C). CO2 emissions are low due to good mixing properties and limestone is injected into the furnace, which binds sulphur dioxide and enables the removal of sulphur in solid form. High-pressure heat and steam from the boiler are fed to the steam turbine, where a generator integrated to the turbine shaft converts them into electricity. Excess heat from the turbine is conveyed to district heat exchangers and condensed for district heating purposes, while the excess steam is distributed either for reuse by the power plant or supplied to industrial customers. The engineering, procurement, construction and commissioning (EPCM) contractor for the project is Pöyry. Valmet is supplying the boiler for the power plant. The company was also contracted to supply its DNA automation and safety interlocking systems for the plant. Siemens is supplying its SST-800 and SST-500 steam turbines, including an SGen5-100A-2P series generator. Pipe systems will be supplied by Caverion, who will also perform electrification works at the project site. Shut-off valves and pipe fittings will be supplied by KSB Finland. The main transformer will be supplied by ABB, whereas the 110kV connection and power transmission lines will be laid by Siemens. Solid fuel-handling systems will be supplied by Raumaster and a desalination plant at the site will be provided by Flootech. Pressure vessels and storage tanks will be supplied by Mercell, while plate heat exchangers will be supplied by Sondex Tapiro.